February. The weather’s gloomy. It’s a long way until spring break. But don’t let the February slump get to you!! 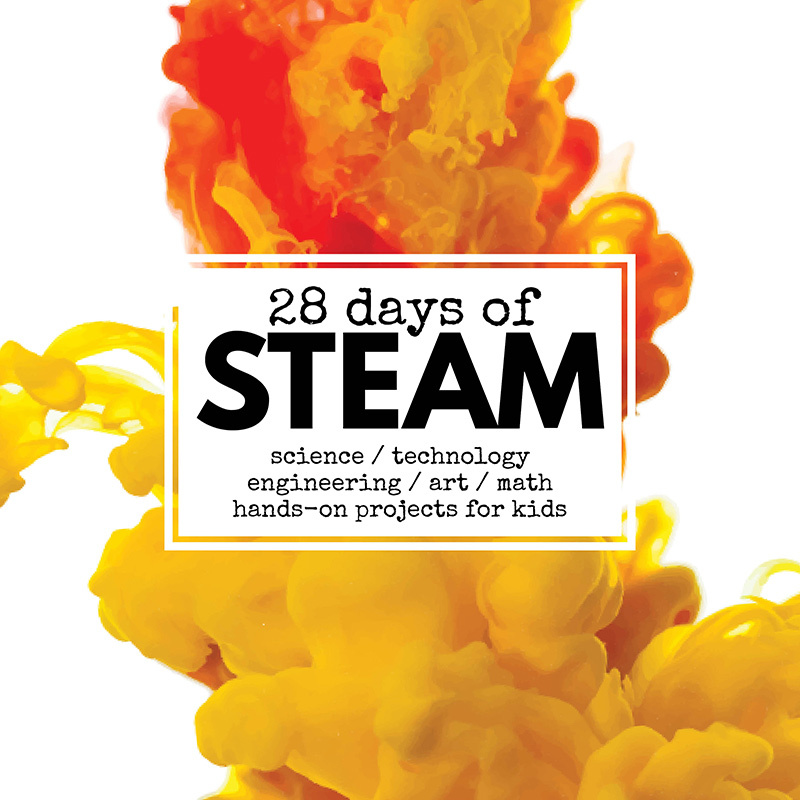 Inject some excitement into your world with 28 Days of STEAM Projects for Kids!! This month I’m sharing 60+ Science, Technology, Engineering, Art, & Math projects that will get your kids and your classrooms excited about learning again. So follow along this month as a huge crew of activity bloggers and I share some cool ideas on printables, nature, storybooks, science fairs and more. Why STEAM (Science, Technology, Engineering, Art, & Math)? STEAM is the abbreviation for Science, Technology, Engineering, Art & Math. It’s an integrated approach to learning that encourages students to think more broadly about real-world problems. This interdisciplinary approach has helped create innovations like the iPhone, the original laptop computer, and is even revolutionizing cooking in third world countries, and improving air quality as a result. So let’s get more STEAM into our kids’ lives. Ready for the fun?!? Hands-on projects are awesome for exciting kids into learning. Printables are awesome for their ease of use. Hands-on learning printables? They’re the holy grail. Fun, exciting activities that the kids really get into, plus all the stuff you want to make it easy for you. Fox and Goose Game || What Do We Do All Day? It’s almost spring. And that means science fairs!!! Check out this list for projects that will wow the judges. We love projects that tie literacy together with another subject. These Book Inspired STEAM activities will get the kids reading and learning some science, tech, engineering, art, & math. Nature is amazing. Beautiful. Intriguing. And an amazing teacher. These projects build on the wonders that are nature. 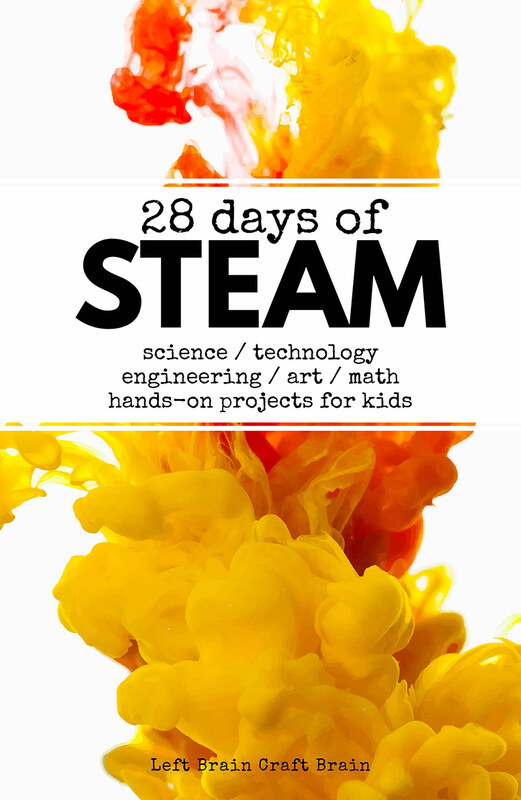 28 days might not be enough :) How about a year’s worth of STEAM? Check out STEAM Kids, a book packed with 52 weeks of hands-on activities that will wow the boredom right out of kids! Want to stay up to date on all the cool projects? I’ll be sharing them daily on the Left Brain Craft Brain Facebook page and pinning them to my Pinterest STEM board. Or come join the STEAM Kids Challenge on Instagram. We’ll be posting new projects and cool ideas every day.